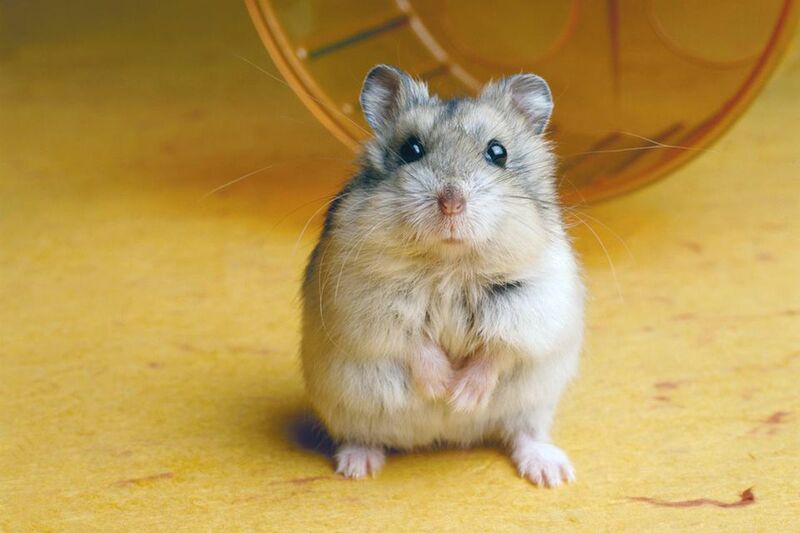 Even though they're often thought of as ideal pets for kids and are usually cuddly, affectionate companions, in some situations, hamsters can and do bite. It's rare for a hamster to actually be aggressive, though, and they typically only bite when they get scared. Those tiny teeth may not do as much damage as those of other animals, but a bite will hurt and should be discouraged. Fortunately, you can gradually train your hamster to accept being handled and stop biting. Tame hamsters are those that have been handled regularly, so they're used to people and don't get scared easily. On the other hand, hamsters that have not been handled much are usually not very tame, and they often bite if you try to pick them up. When you're dealing with these hamsters, the most important thing to remember is that they're biting because they're afraid, not because they're aggressive. The key to handling a hamster that bites is patience. You need to earn the trust of your hamster, and this is a slow and gradual process. This a good approach if you've had a hamster for some time and biting continues to be an issue. It's also a great way to introduce yourself to a new hamster that may be a little shy at first. Don't be discouraged if it takes a month or even longer to gain your hamster's trust. And if your hamster settles down and responds faster than expected, you can shorten the time between the steps. If your hamster is still fearful at any point, go back to the previous step and spend a little more time working on it. Over time, your hamster will learn to see you as a source of treats and not be scared of you. It will take a while, but it will be worth it in the end. In the evening when it's most active, spend some time sitting near the cage and talking to your hamster. You can read or even sing to it if you don't know what to say. The idea is to let your hamster adjust to your presence, especially your scent and your voice. Remember, moving to a new cage in new surroundings is very stressful, so this period also gives your hamster a chance to adjust to life in its new home. At this point, don't try to touch your hamster. During these early days with your hamster, you may need to pick it up to do cage cleaning or return it to the cage after an escape. To pick up your hamster before it has fully learned to accept you, herd it into a corner with a towel or the open mouth of a drinking glass, then scoop it up gently in the towel or glass. While continuing to sit by the cage and talk to your hamster, place your hand inside the cage. Move very slowly. The first day, put your hand just inside the door or on top of the cage. Each day after that, try putting your hand in a little farther. Don't try to touch your hamster, but if it becomes curious, let it sniff or explore your hand. By now, you may have discovered some of your hamster's favorite treats. If not, try sunflower seeds, raisins, and apples. While you should only feed your pet these treats in moderation, they can be great training tools. Offer your hamster these goodies from the bare hand that you've been putting in its cage. Eventually, it will probably come over to eat, which will help you gain its trust. Once your hamster is taking treats comfortably, you can begin trying to gently pet it. If it tolerates this, you can move on to the next step of picking up your hamster. Otherwise, continue to patiently offer treats and petting. If your hamster accepts treats and allows you to touch it, it's time to try picking up your pet. Once again, go slowly and let your hamster guide how far you get in each session. A good approach is to entice your hamster onto your hands with the treats. Then, you can try scooping it up with both hands. Place one hand on either side of your hamster and then bring your hands together under its belly. Gently cup your hamster in your hands, rather than tightly gripping over its back. Hamsters sometimes find pressure over their backs to be threatening at first. Don't hold your hamster high off the ground in case it tries to jump out of your hands. At first, try holding it just off the floor of its cage, gradually lifting a little higher. Holding a hamster facing your body may make it less likely to try to jump away. Wash your hands before handling your hamster so your fingers don't smell like food. While wearing thick gloves can offer protection, do so only temporarily as hamsters are best tamed when they become familiar with your scent, which they can't detect well through the gloves. If the hamster is clamped onto your hand, don't shake your hand to dislodge it. Try to gently put it back down or use your other hand to pry it off. Never scold, yell, or hit the hamster. Try to stay calm and remember your hamster is biting out of fear, not aggression.